I saw this recipe on Kraft foods a few months ago & finally tried it. Super easy & tasty. HEAT grill to medium heat. 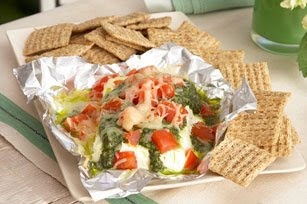 Place unwrapped Neufchatel cheese on 8-inch square sheet of heavy-duty foil; top with pesto, tomatoes and shredded cheese. PLACE foil on grill; cover with lid. Grill 8 to 10 min. or until shredded cheese is melted and Neufchatel is softened, but still holding its shape. TRANSFER foil to platter. Serve spread with crackers.